Abbeyside Team (R to L): N. McGovern, J. Hogan, A. Flynn, L. O'Dea, G. Foley, G. Flynn, D. Whelan, P. Whelan, P. Clancy, A. Hayes, J. Clancy, L. Whelan. Last Sunday, Abbeyside defeated Dungarvan in the County Senior Hurling Championship. 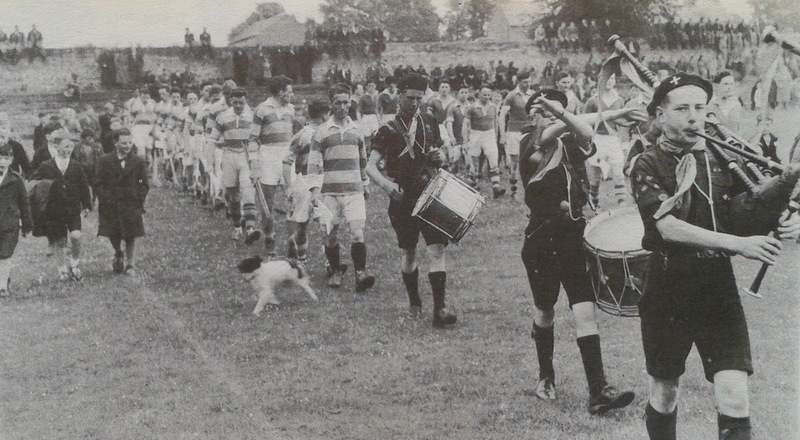 This week's photo brings us back to the 1955 first round meeting between the sides. Noel McGovern leads his charges in the pre-match parade behind the Scouts' Band at Fraher Field. A comprehensive 5-9 to 0-2 win over the Old Boro and later victories over Ballyduff and Tourin set the Villagers on their way to their first County Senior Hurling Final. Our popular Jack the Joker Fundraiser will continue this Sunday night in Kennedy’s Live where the Jackpot will be €3,500 as on Sunday night Feihe Spratt was drawn out of the drum and picked card 2 but did not find the Joker, yet she did win €50. Majella Dwane and Nora Coburn won €25 each. We played Dungarvan on Sunday night in Fraher Field in our final game of the County Championship and thanks to a strong performance in the final twenty minutes we came away with a good win. We now play Fourmilewater in the quarter final. TEAM: S. ENRIGHT, S. O’DONOVAN, S. O’HARE, J. POWER, J. HURNEY, J. GORMAN, M. POWER, R. FOLEY, D. COLLINS, M. FIVES, G. HURNEY, G. BREEN, M. FERNCOMBE, P. HURNEY, M. GORMAN. SUBS: S. CROTTY, C. HICKEY, M. O’HALLORAN. We had a very good win over Clashmore last Friday in the Western Championship. TEAM: J.P. McGRATH, J. WALSH, A. O’RAGHNAIGH, D. FERNCOMBE, R. SHEEHAN, L. BERESFORD, C. ENRIGHT, B. HENLEY, B. WALSH, E. YOUNG, R. RYAN, M. MAHER, K. KELLEHER, I. KIELY, M. RAHER. We suffered a heavy defeat to Brickey Rangers last Sunday in Fraher Field in our final game of the group stages of the Western Championship. TEAM: L. POWER, T. McGRATH, J. MOORE, S. O’CONNOR, B. LOOBY, E. BERGIN, J. DUGGAN, N. DEE, C. KINDREGAN, P. COLLINS, L. HURNEY, D. HICKEY, T. MURRAY, S. SLATER, S. CLIFFE. This Sunday we play Brickey Rangers in Fraher Field at 2pm in our final game of the group stages of the Championship. Our Bingo continues this Sunday night in the CBS Hall where the jackpot is €1400. Our Under 16 footballers started their championship campaign on Monday night of last week against our near neighbours in Dungarvan at the Burgery. After kicking some great scores and playing well as a team our lads pulled away at the end in what was a very good display of football. There are a lot of fixtures coming up in the next few weeks at this grade so the players should check training times etc with the team management. Please click here to view pictures of our County Senior Hurling Championship victory over Dungarvan in Fraher Field on Sunday evening last. Many thanks to Seán Byrne Photography for the team and action shots and to Emer Enright for the scoreboard picture!! This is the league table after the fifth and final round of games in Abbeyside’s County Senior Hurling Championship Group. Mount Sion, Passage, Abbeyside and Ballygunner have qualified for the quarter finals. L to R: Bernard Shields, Joseph 'Tucky' Organ, Michael Briggs, Matthew Hogan. This week's photo shows great club men Bernard Shields, Joseph 'Tucky' Organ, Michael Briggs and Matthew Hogan at Clonea Strand Hotel with the trophies won by the club in 2003. 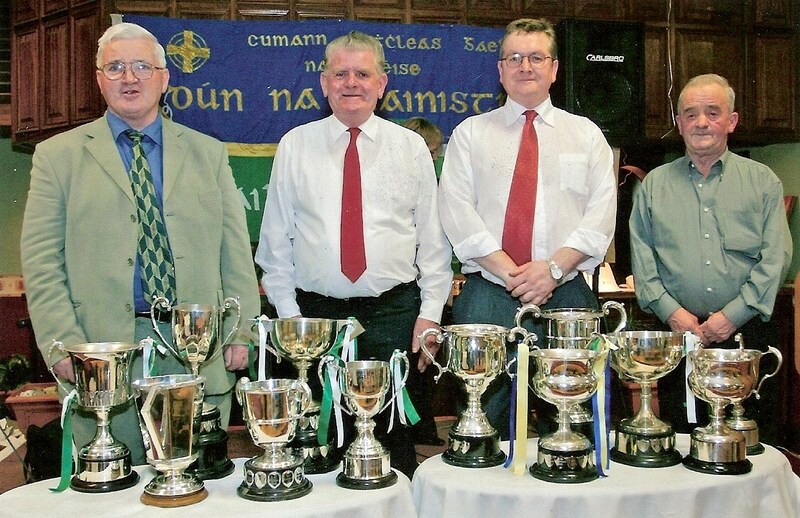 The titles won that year were the Western & County Intermediate Hurling, Western Junior 'B' Hurling, Western & County Minor 'A' Hurling, Western & County U21 'A' Football, Western & County Minor 'A' Football, Western & County U16 'A' Football and Western U14 'A' Football. Undoubtedly one of the most successful years in the club's history. Our popular Jack the Joker Fundraiser will continue this Sunday night in Kennedy’s Live where the Jackpot will be €3,224 as on Sunday night Dermot O’Shea was drawn out of the drum and picked card 42 but did not find the Joker, yet he did win €50 euro. Keeva Fennelly and Maurice O’Donnell won €25 each. We played Roanmore on Saturday night in Walsh Park in our fourth game of the County Championship and came away with a good win. This Sunday we play Dungarvan in Fraher Field at 7pm. SUBS: S. CROTTY, C. HICKEY, T. HANRAHAN, E. ENRIGHT, M. O’HALLORAN. We had a very good win over Shamrocks last Sunday at in Lismore in the Western Championship. This Friday night we play in Clashmore in Ring at 7:15pm. SUBS: D. O’HARE, R. PROCTOR. We play Brickey Rangers this Sunday in Fraher Field at 3:30 pm. We have been informed by the County Board that the club will probably only receive 10 tickets for the All Ireland Final so people who have looked for tickets should be aware that it will be impossible for the club to satisfy the demand from our members. Our Bingo continues this Sunday night in the CBS Hall where the jackpot is €1350. Our minor hurling team played their third round of the county minor hurling championship campaign last Tuesday evening against a very strong Dungarvan outfit. We played well in the first half but Dungarvan ran out easy winners at the end. Everyone in the club would like to wish Eamonn Crotty a speedy recovery after he picked up a nasty hand injury in this game. We hope to see this talented player back on the playing fields as soon as possible. Our under16 football county championship campaign got under way on Monday last against near neighbours Dungarvan. At the time of going to print the result of this match is unavailable but it will be included in next week’s notes. Outdoor hurling continues every Saturday morning from 10.30 for boys age five and up. Helmets and hurleys can be purchased through the club at a discounted price. All newcomers are welcome. This is the league table after the fourth round of games in Abbeyside’s County Senior Hurling Championship Group. The first four teams qualify for the quarter finals. The league position of teams on equal points is determined by the result between both teams.